Pancreatic cancer remains the fourth leading cause of cancer-related death in the US and is expected to be the second leading cause of cancer-related death by 2030. Therefore, it is important to better understand the molecular pathogenesis, phenotypes and features of pancreatic cancer in order to design novel molecularly targeted therapies for achieving better therapeutic outcome of patients with pancreatic cancer. Recently, the roles of microRNAs (miRNAs) in the development and progression of pancreatic cancer became a hot topic in the scientific community of pancreatic cancer research. By conducting miRNA expression profiling, the aberrant expression of miRNAs was revealed in the serum and in cancer tissues from patients with pancreatic cancer. These aberrantly expressed miRNAs are critically correlated with the disease stage, drug resistance, and survival of pancreatic cancer patients. Hence, targeting these tiny molecules, the specific miRNAs, could provide an efficient and optimal approach in the therapy of pancreatic cancer. Indeed, the pre-clinical and in vivo experiments showed that nanoparticle delivery of synthetic oligonucleotides or treatment with natural agents could be useful to modulate the expression of miRNAs and thereby inhibit pancreatic cancer growth and progression, suggesting that targeting miRNAs combined with conventional anti-cancer therapeutics could be a novel therapeutic strategy for increasing drug sensitivity and achieving better therapeutic outcome of patients diagnosed with pancreatic cancer. Pancreatic cancer remains one of the most aggressive malignances in the US. The researchers in American Cancer Society have estimated that 48,960 new cases of pancreatic adenocarcinoma will occur in the US during 2015 and that 40,560 deaths from pancreatic cancer is expected in 2015 . Importantly, pancreatic cancer is the fourth leading cause of cancer related death in the US  and it is expected that pancreatic cancer will become the second leading cause of cancer-related death by 2030 . The high mortality of pancreatic cancers is in part due to the lack of diagnostic symptoms in the early stages, the absence of early detection tools for pancreatic cancer, and the shortage of optimal therapeutics that can also overcome drug resistance. Metastasis is another reason for the high mortality. About 50 % of patients with pancreatic cancer have metastasis at the time of diagnosis [3-5]. In recent years, with the advancement of therapies, the overall survival of patients with metastatic pancreatic cancer slightly increased from 6 months to nearly 1 year [6;7]. However, 5-year survival of all stages of pancreatic cancer is only 7% with 2% for distant and 26% for localized disease , suggesting that the clinical outcome of patients with pancreatic cancer remains poor. Therefore, there is an urgent need for better understanding the molecular pathogenesis, phenotypes and features of pancreatic cancer in order to design novel molecularly targeted therapies for the treatment of pancreatic cancer. Recently, the roles of microRNAs (miRNAs) in the development and progression of cancers including pancreatic cancer became one of the major hot topics in cancer research. Emerging studies have been focused on the biosynthesis, function, and the molecular regulation of miRNAs in normal physiological and pathological conditions in chronic diseases including different types of cancers. The emerging evidence also shows that the tiny molecule, the miRNA, has huge impact on cell growth, differentiation, and apoptosis through the regulation of specific gene expression [8-10]. The miRNAs are a naturally occurring, non-coding small (commonly 19-22 nucleotide long) RNAs which are highly conserved across different species and highly specific for developmental stages [8-10]. In vivo, miRNAs are biosynthesized from differential miRNA genes and matured from pri-miRNA and pre-miRNA to miRNA. In cells, RNA polymerase II is necessary for constructing miRNA chains. Firstly, using miRNA gene as templates RNA polymerase II synthesizes miRNA precursors (pri-miRNAs) which have comparatively longer sequences. Following this transcription, Drosha and Dicer cut the pri-miRNA to produce pre-miRNA duplex which moves from nucleus to cytosol. In cytosol, the miRNA duplex is dissociated and the single strand miRNA becomes the mature miRNA. The mature miRNA is then incorporated in the complex known as RNA-induced silencing complex (miRISC). In the majority of cases, by binding of miRNA to the 3'-UTR of target mRNAs through partial complementarity, miRNA induces the process for silencing the protein expression of the target genes through translational repression or mRNA degradation [10-12]. Because miRNAs control cell growth, differentiation and apoptosis, the alterations in the expression of miRNAs has been correlated with cancer development and progression [13;14]. By conducting miRNA expression profiling, the aberrant expression of miRNAs has been found in various cancers including pancreatic cancer. In pancreatic cancer cells, several miRNAs act as oncogenic mediators which inhibit the expression of tumor suppressors, resulting in development and progression of pancreatic cancer. On the other hand, some miRNAs function as tumor suppressors which down-regulate the expression of oncogenes, and thereby inhibit cancer growth and aggressiveness. Significantly increased levels of oncogenic miRNAs and decreased levels of tumor suppressive miRNAs have been found in pancreatic pre-cancerous and cancerous cells [15-17], suggesting that the aberrant expressions of miRNAs together with the disorders of cellular signal transduction constitute the molecular basis of pancreatic cancer development and progression as presented by a simplistic diagram (Figure 1). Since each miRNA has hundreds of different conserved or non-conserved targets, the alterations in the level of a specific miRNA could cause significant alterations in the expression of many genes, and thereby promote aberrations in multiple cellular signal transduction pathways, resulting in development and progression of pancreatic cancer. Therefore, targeting these miRNAs could provide an efficient approach for prevention or treatment of pancreatic cancer through the regulation of multiple genes. The roles and regulation of miRNAs in the development and progression of pancreatic cancer. Because of the aggressive feature of pancreatic cancer, early detection has been recognized to be very important for decreasing mortality of pancreatic cancer. However, many pancreatic cancers already are at the metastatic stages at the time of diagnosis, and there is no means of early detection to-date. Thus, growing studies have been focused on miRNA profiling using the serum from patients with pancreatic cancer in order to find some valuable biomarkers that could be used in early diagnosis of pancreatic cancer, at least, in high-risk subjects, and also in assessing the prognostic significance of miRNAs in pancreatic cancer (Table 1). Because serum or plasma miRNA profiling is relatively non-invasive and convenient, the results from these studies could provide invaluable information in support of the early detection of pancreatic cancer and for the prognostication. In the following paragraphs we will summarize what is known for the serum or plasma miRNAs in pancreatic cancer patients. A study on the plasma miRNAs as diagnostic biomarkers for pancreatic cancer has been conducted to investigate whether miRNAs together with CA19-9 could be useful for early detection of pancreatic cancer . It was found that the expression levels of miR-16, miR-21, miR-155, miR-181a, miR-181b, miR-196a and miR-210 were significantly increased in plasma from pancreatic cancer patients compared to the levels in plasma from pancreatitis patients and normal adults. Moreover, the increased levels of miR-16 and miR-196a combined with increased level of serum CA19-9 have been found to be more effective for distinguishing pancreatic cancer from pancreatitis and normal individuals. Furthermore the study showed that the combined biomarkers were specifically effective for diagnosis of pancreatic cancer at stage 1, suggesting the value of these biomarkers for early detection of pancreatic cancer in tumor screening . In addition, other studies also showed that testing for the expression levels of miR-16 in plasma or miR-27a-3p in peripheral blood mononuclear cells in combination with serum CA19-9 could provide a better diagnostic accuracy with high sensitivity and specificity for the diagnosis of pancreatic cancer [19;20]. To compare the sensitivity and specificity between serum miRNA detection and CA19-9 for the diagnosis of pancreatic cancer, a case-control study including large number (409) of patients with pancreatic cancer was conducted. The results showed that the expression levels of 38 miRNAs in the whole blood were significantly altered in patients with pancreatic cancer . From these results, two diagnostic panels were constructed. Panel one consisted of miR-145, miR-150, miR-223, and miR-636 while panel two included miR-26b, miR-34a, miR-122, miR-126, miR-145, miR-150, miR-223, miR-505, miR-636, and miR-885. The sensitivities and specificities of these two panels were less than that of CA19-9. However, when these two panels were combined with CA19-9, the sensitivity and specificity for the diagnosis of pancreatic cancer were significantly increased . This study was consistent with other studies [18;19], demonstrating that circulating miRNA detection combined with CA19-9 measurement could be useful for early detection of pancreatic cancer. To improve the early detection of pancreatic cancer, a study was conducted to find specific serum miRNAs that could be useful for distinguishing patients with low-stage pancreatic cancer from healthy controls. This study showed that serum miR-1290 had the best diagnostic performance among the miRNAs tested . The expression level of serum miR-1290 specifically discriminated low stage pancreatic cancer patients from controls. The discrimination by miR-1290 was better than that of CA19-9, suggesting that testing for plasma miR-1290 could significantly improve the early detection potential of pancreatic cancer. Another study also found that the combination of eight miRNAs including miR-6075, miR-4294, miR-6880-5p, miR-6799-5p, miR-125a-3p, miR-4530, miR-6836-3p, and miR-4476 could have higher sensitivity and specificity for the diagnosis of pancreatic cancer compared to CA19-9 and CEA . This miRNA panel also identified 18/21 operable pancreatic cancers, suggesting that this panel of miRNAs would be very useful for identifying operative pancreatic cancer cases without further clinical workups . These findings, although limited, clearly suggest that some serum/plasma miRNAs may possess better diagnostic features than CA19-9 and CEA for the diagnosis of pancreatic cancer. Serum miRNA expression profiling has also been performed for testing the specificity and sensitivity of a set of specific miRNAs as biomarkers in the diagnosis of pancreatic cancer . It was found that the expression of several miRNAs including miR-20a, miR-21, miR-24, miR-25, miR-99a, miR-185, and miR-191 in the serum from patients with pancreatic cancer was significantly up-regulated compared to cancer-free control subjects. These up-regulated miRNAs showed high sensitivity and specificity for distinguishing various stages of pancreatic cancer from non-cancer controls and pancreatitis patients. In addition, the expressions of serum miR-196a and miR-196b were up-regulated in patients with pancreatic cancer. The combination detection of both miR-196a and miR-196b showed high sensitivity and specificity for diagnosis of pancreatic cancer and high-grade PanIN lesions . The levels of miR-1246, miR-4644, miR-3976 and miR-4306 were also significantly increased in serum-exosomes from pancreatic cancer patients and showed high sensitivity and specificity for the diagnosis of pancreatic cancer . Together, the results from different experiments suggest that testing serum/plasma miRNA expression may provide a new non-invasive approach for diagnosis of pancreatic cancer. From the results, it is obvious that a panel including multiple serum/plasma miRNAs could provide higher sensitivity and specificity as diagnostic biomarkers for pancreatic cancer detection. Studies have shown that a specific miRNA or a group of miRNAs could be better diagnostic markers compared to CA19-9 [22;23]. However, combination of these miRNAs and CA19-9 significantly increases sensitivity and specificity for the diagnosis of pancreatic cancer (Table 1), providing new sensitive and accurate diagnostic strategy for pancreatic cancer. In order to find whether specific serum miRNAs could be useful as prognostic biomarkers for pancreatic cancer, a penal of miRNAs were tested. It was found that the level of serum miR-196a in patients with unresectable pancreatic cancer was significantly up-regulated than those in patients with resectable pancreatic cancer . Moreover, the study found that the higher levels of serum miR-196a was significantly correlated with poor survival of patients with pancreatic cancer, suggesting that serum miR-196a could be useful as non-invasive marker for prognosis of pancreatic cancer and selection of therapeutic strategy . Several studies have shown the value of increased expression of serum miR-21 as prognostic biomarkers in pancreatic cancer [24;28;29]. The level of plasma miR-21 was increased in pancreatic cancer. Moreover, the level of plasma miR-21 was significantly correlated with advanced stage, metastasis to lymph node and liver, and poorer survival of patients with pancreatic cancer . Moreover, serum miR-21 could serve as a biomarker for drug resistance in the treatment of pancreatic cancer. Importantly, it was also found that miR-21 could protect the pancreatic cancer cells from gemcitabine-induced apoptosis through the inhibition of its target FasL . Similar results were also reported by others showing that serum miR-21 levels were increased in gemcitabine-resistant pancreatic cancer patients compared with gemcitabine-sensitive patients [31;32]. These findings clearly suggest the importance of serum miR-21 in the prognosis of pancreatic cancer. Therefore, a targeted approach for the inactivation of miR-21 could become a newer method for better treatment of pancreatic cancer. In addition to miR-21, plasma miR-221 and miR-18a were also significantly increased in pancreatic cancer patients compared with control subjects [32-34]. It was found that the higher expression of plasma miR-221 was correlated with distant metastasis and that the levels of plasma miR-221 and miR-18a were significantly decreased after surgery, suggesting that plasma miR-221 could be a useful biomarker for monitoring therapeutic success in patients with pancreatic cancer [32-34]. Moreover, plasma miR-223 was significantly up-regulated in pancreatic cancer and was significantly decreased after surgery . These findings demonstrate that serum miRNAs such as miR-221, miR-18a and miR-223 could be used as suitable biomarkers for monitoring therapeutic benefit or final treatment outcome. Other serum miRNAs also showed their function as predictive biomarkers in the prognosis of pancreatic cancer patients. The expression of serum miR-492 and miR-663a were significantly down-regulated in pancreatic cancer patients . Moreover, the expression levels of miR-663a was significantly and inversely correlated with TNM stage of pancreatic cancer, suggesting that serum miR-492 and miR-663a could be non-invasive biomarkers for the prognosis of pancreatic cancer patients . It was also reported that the levels of serum miR-194 were up-regulated in patients with pancreatic cancer when compared with control . Further studies have shown that the introduction of miR-194 into pancreatic cancer cells increased cell proliferation, migration and colony formation through the inhibition of DACH1, suggesting that miR-194 overexpression contributes to tumor growth and poor prognosis of pancreatic cancer patients . Since pancreatic cancer is an aggressive malignance, prognosis of pancreatic cancer is important in the management of pancreatic cancer therapy. The findings described above strongly suggest that several specific miRNAs such as miR-21, miR-196a, miR-21 and miR-18a are useful prognostic biomarkers for predicting survival, monitoring surgical outcome, and selecting therapy based on drug sensitivity. Testing serum/plasma miRNAs is non-invasive; therefore, it provides convenient approach for the management of pancreatic cancer therapy. Since aberrant expressions of miRNAs play important roles in carcinogenesis, the miRNA expression profiles in pancreatic adenocarcinoma have been investigated [16;38-43]. By profiling miRNA expression, it has been found that the altered miRNA expression profiles of cancer cells were significantly associated with progression, drug-resistance, and prognosis of pancreatic cancer patients. The pancreatic cancer tissues from different sources such as fine-needle biopsy, fresh frozen tissue, and formalin-fixed paraffin-embedded tissues have been used for miRNA profiling. A miRNA microarray study using fine-needle aspirates (small biopsy samples) of pancreatic cancer patients was conducted for assessing the miRNA profiles of pancreatic cancers compared to normal pancreatic tissues. The results showed that a total of 158 miRNAs were aberrantly expressed where the expression of 51 miRNAs was increased and 107 miRNAs were decreased. Further analysis showed that the expression levels of miR-21, miR-27a, miR-200a, and miR-196a were increased and the levels of miR-217, miR-20a, and miR-96 were decreased in pancreatic cancer specimens . The global miRNA microarray was also conducted using fresh tissues from pancreatic cancer patients. The increased expression of miR-21 and decreased expression of miR-34a and miR-30d were found in pancreatic cancer, and the alterations in the expressions of miR-21 and miR-34a were associated with poor overall survival . The miRNA profiles using formalin-fixed paraffin-embedded tissues from pancreatic cancer and adjacent normal control tissues were also investigated. The results showed 43 miRNAs were up-regulated while 41 miRNAs were down-regulated. Among them, miR-614, miR-492, miR-622, miR-135b and miR-196 were most differentially expressed . In a study using large number of pancreatic cancer and normal control tissues, it was found that the expressions of miR-21, miR-155, miR-210, miR-221, and miR-222 were significantly increased while the levels of miR-31, miR-122, miR-145, and miR-146a were decreased in pancreatic cancer tissues . Moreover, the expression levels of miR-21 and miR-155 were significantly correlated with tumor stage and poor prognosis . These results suggest that the aberrant expressions of some miRNAs are responsible for the development and progression of pancreatic cancer. To compare the differential miRNA expression signatures involved in tumor transformation between pancreatic benign cystic tumor and pancreatic cancer, miRNA microarray was conducted using formalin-fixed paraffin-embedded and fresh surgical specimens from pancreatic cancer patients. Among the large number of decreased miRNAs, the miR-16, miR-126 and let-7d which typically target oncogenes were significantly down-regulated . Moreover, miR-21 up-regulation appeared to be an early event in the transformation from normal pancreatic tissue to pancreatic cancer . Intraductal papillary mucinous neoplasms (IPMN) include different grade of tumors from low-grade dysplastic lesion to invasive cancer. Investigating the miRNA profiles of the differential grades of IPMN could reveal the roles of altered miRNAs in the development and progression of pancreatic cancer. To that end, it was found that the expression levels of miR-100, miR-99b, miR-99a, miR-342, miR-126, and miR-130a were decreased while the expressions of miR-130a, miR-342, and miR-126 were increased in high-risk IPMNs compared to low-risk IPMNs , suggesting the value of these miRNAs for the prediction of risk of developing pancreatic cancer. Another study showed that miR-21, miR-155, miR-150, miR-148a, and miR-217 had significantly different expression patterns between benign IPMN and malignant IPMN , suggesting that these miRNAs are critical for tumor transformation from benign to malignant. Furthermore, up-regulated expression of miR-21 and miR-155, and deceased levels of miR-148a and miR-217 were observed in IPMN with invasive pancreatic cancer , suggesting their roles in the progression of pancreatic cancer. Although each miRNA profiling study may show differential miRNA alterations because of different sample sources and techniques used, the increased levels of miR-21, miR-221, and miR-155, and the decreased levels of miR-145 and miR-34 in pancreatic cancer tissues are consistent and more frequently observed in different miRNA profiling studies as summarized in a diagram (Figure 1). In the following sections, we will summarize the role of some selected miRNAs in pancreatic diseases. The up-regulation of miR-21 has been found in pancreatic cancer tissues and cell lines. In a study, eighty pancreatic cancer specimens were microdissected and tissue microarrays were created for in situ hybridization for assessing the expression of miR-21. The expression of miR-21 was observed in 63 (79%) pancreatic cancers with strong signal while it was only detected in one of 12 (8%) benign pancreas and 12 (27%) chronic pancreatitis cases with moderate expression . Further analysis showed that strong miR-21 expression was associated with poorer survival of patients . The miR-21 has also been found to be significantly overexpressed in pancreatic cancer cell lines compared to nonmalignant pancreatic cells. Transfection of miR-21 into pancreatic cancer cells significantly increased proliferation, invasion, and chemoresistance to gemcitabine . It was also found that the expression of miR-21 was associated with PanIN progression in the K-ras mutant mouse model . Patients with high level of miR-21 had a significantly shorter overall survival. Enforced expression of miR-21 in pancreatic cancer cells significantly reduced the anti-proliferative and apoptotic effects of gemcitabine with the up-regulation of MMP-2, MMP-9, and VEGF, suggesting important role of miR-21 in gemcitabine chemoresistance . In contrast, low expression of miR-21 was associated with benefit from adjuvant treatment and anti-miR-21 approach increased anti-cancer drug activity in in vitro studies . Inhibition of miR-21 in pancreatic cancer cells caused decreased cell proliferation and increased apoptosis with up-regulation of PDCD4 and PTEN, suggesting that PDCD4 and PTEN could be targets of miR-21 (Figure 1) [50-54]. The level of miR-21 was also increased in tumor-associated fibroblasts (TAFs) in pancreatic cancer tissues. The high expression of miR-21 was significantly associated with poor overall survival and lymph node invasion, suggesting that tumor-associated fibroblasts promote the aggressive biological behavior of pancreatic cancer cells . The up-regulated expression of miR-155 was found in pancreatic pre-cancerous and cancer cells. 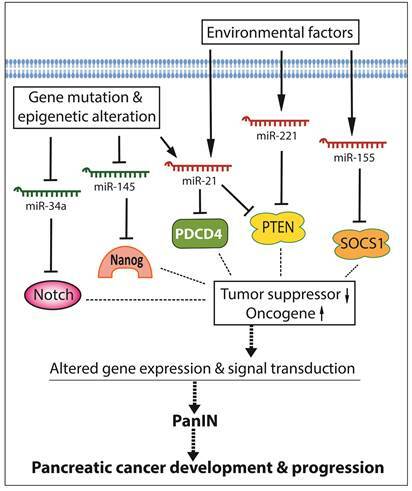 In PanIN, significant up-regulation in the expression of miR-155 was also found in both PanIN-2 and PanIN-3, suggesting that the aberrant expression of miR-155 plays important role in the development and progression of pancreatic cancer . Moreover, significant correlation between increased miR-155 expression and overall survival were found in patients with pancreatic cancer , suggesting that miR-155 plays a critical role in the progression of pancreatic cancer. Molecular studies on miRNA profiles also demonstrated that the expression of miR-155 was up-regulated in pancreatic cancer tissues and that the expression of suppressor of cytokine signaling 1 (SOCS1) was lower in cancer tissues and higher in tumor-adjacent tissues. Moreover, the level of miR-155 expression was correlated with lymph node metastasis and clinical stage, suggesting that miR-155 could regulate pancreatic cancer cell invasion and migration by targeting SOCS1 signaling in pancreatic cancer cells (Figure 1) . It has also been reported that miR-155 regulated the expression of Mut L homologue 1 (MLH1), and further mechanistic studies showed that the expression of MLH1 was down-regulated in pancreatic cancer and that the transfection of pre-miR-155 into pancreatic cancer cells inhibited the expression of MLH . Moreover, high expression of MLH1 was significantly correlated with favorable differentiation and less lymph node metastasis . Furthermore, miR-155 knock-down could lead to the inhibition of cell growth and colony formation with reduced expression of EGFR, MT1-MMP, and K-Ras , suggesting multiple targets of miR-155 in pancreatic cancer progression. It is well known that the expression of miR-221 is significantly increased in pancreatic cancer [17;41;60-62]. It has been reported that the expression of miR-221/miR-222 was increased in different grades of PanIN lesion, especially in PanIN-2 and PanIN-3, suggesting its role in development and progression of pancreatic cancer . Moreover, by in situ hybridization, miR-221 was found to be highly expressed in more malignant cells of pancreatic cancer, suggesting that miR-221 also contributes to the progression of pancreatic cancer . Furthermore, high miR-221 expression has been associated with distant metastasis and non-resectable status . The patients with high miR-221 expression also had a relatively shorter survival compared to those with lower expression of miR-221. Molecular mechanistic studies have shown that enforced introduction of miR-221 inhibitor (anti-miR-221) into pancreatic cancer cells could significantly decrease the proliferative capacity of pancreatic cancer cells together with increased expression of PTEN, p27kip1, p57kip2, and PUMA , suggesting that miR-221 could induce pancreatic cancer cell growth through the inhibition of its targets such as PTEN, p27kip1, p57kip2, and PUMA (Figure 1). As documented in the literature that pancreatic stellate cells (PSCs) contribute to development and progression of pancreatic cancer, it was found that the expression of miR-221 was increased in PSCs, leading to increased cell proliferation and movement mediated though the regulation of MAPK and Smad signaling . These findings demonstrate the multiple targets of miR-221 in pancreatic cancer cells and stellate cells in the tumor microenvironment. In pancreatic cancer cells, the expression of miR-145 has been found to be significantly down-regulated . It is known that K-ras activation could cause the repression of the miR-143/145 cluster . In pancreatic cancer cells, decreased expression of miR-145 could partly be due to the activation of K-ras . Moreover, miR-145 could inhibit the expression of insulin growth factor-1 receptor . In addition, miR-145 could also target pluripotency maintenance factors such as OCT4, SOX2, NANOG, and KLF4 (Figure 1) . Enforced expression of miR-145 (transfecting cells with pre-miR-145) reduced the expression levels of cancer related genes including ITGA11, MAGEA4, SET, RPA1, MCM2, ABCC1, SPTBN1 and SPTLC1 . All of these miR-145 target genes are critical for pancreatic carcinogenesis, stemness maintenance, and growth of pancreatic cancer. In pancreatic cancer cells, the level of expression of miR-146a has been found to be down-regulated [70;71]. Pancreatic cancer tissues also showed decreased expression of miR-146a . In addition, activated pancreatic stellate cells has been found to express low levels of miR-146a . Further molecular mechanistic studies have shown that enforced expression of miR-146a (transfection of cells with pre-miR-146a) suppressed the invasive capacity of pancreatic cancer cells through down-regulation of EGFR, IRAK-1, and MTA-2 . Further experiments showed that treatment of pancreatic cancer cells with isoflavone could induce the expression of miR-146a and consequently inhibited the expression of EGFR, IRAK-1, and NF-κB, leading to reduced invasion of pancreatic cancer cells . These findings suggest the anti-cancer activity of miR-146a; however, a controversial report showed that the expression of miR-146a was up-regulated in PanIN, suggesting its role in promoting pancreatic carcinogenesis . Further investigation on the expression levels of miR-146a in a large number of pancreatic cancers and PanIN are needed to delineate the role of miR-146a in pancreatic cancer development and progression. A global miRNA microarray study has shown that the expression level of miR-34a was down-regulated in pancreatic cancer, and the decreased miR-34a expression was correlated with poor overall survival of pancreatic cancer patients . The down-regulation of miR-34a could in part be due to epigenetic regulation because hypermethylation of miR-34a gene has been found in 64% of pancreatic cancer tissues . Moreover, it was found that demethylating agent 5-Aza-2'-deoxycytidine and HDAC inhibitor Vorinostat (SAHA) treatment could lead to the re-expression of miR-34a in human pancreatic cancer stem cells and in human pancreatic cancer cell lines, leading to the inhibition of cell proliferation, cell cycle progression, self-renewal capacity, epithelial-to-mesenchymal transition, and invasion . These results clearly suggest that epigenetic regulation contributes to the silencing of miR-34a expression in pancreatic cancer, and thus a novel demethylating agent could also function as a newer therapeutic drug for the treatment of pancreatic cancer. The miR-34a could target Bcl-2 and Notch signaling (Figure 1). Enforced expression of miR-34 (transfection of cells with pre-miR-34a) in pancreatic cancer cells significantly suppressed the expression of Bcl-2, Notch1, and Notch2, resulting in the suppression of cancer cell proliferation and invasion, the induction of apoptosis and cell cycle arrest, and the sensitization of cancer cells to chemotherapeutics and radiation [75;76]. In addition, promoter assays also showed that the promoter activity of miR-34a gene was suppressed by the altered MAPK activity in pancreatic cancer cells . In addition, miR-34b could be another tumor suppressive miRNA which targets oncogenic Smad3 in pancreatic cancer. In human pancreatic cancer, the level of miR-34b has been found to be significantly decreased and the decreased miR-34b expression has been found to be associated with lymph node metastasis, cancer stage, and overall survival . Enforced expression of miR-34b (transfection of cells with pre-miR-34b) suppressed the progression of pancreatic cancer via inhibition of Smad3 , suggesting the anti-cancer role of miR-34b in pancreatic cancer. In addition to the miRNAs described above, studies also reported that miR-1247 and miR-150 were significantly decreased in pancreatic cancer tissues [79;80]. Further studies showed that high expression of miR-1247 was associated with longer overall and recurrence free survival in pancreatic cancer patients  and that miR-150 inhibited the growth of pancreatic cancer through the suppression of its target MUC4 , suggesting the anti-cancer value of miR-1247 and miR-150 in pancreatic cancer. Since aberrant expressions of miRNAs are significantly correlated with the development and progression of pancreatic cancer, reversing the altered miRNAs may become a hopeful strategy for the prevention and treatment of pancreatic cancer. Recently, growing evidences have demonstrated that miRNA delivery, miRNA and anti-cancer drug co-delivery, or treatment with natural agents that regulate the expression of miRNAs could modulate cellular signal transduction, leading to suppression of pancreatic carcinogenesis and cancer progression. These have been summarized in the diagram as presented in Figure 2. 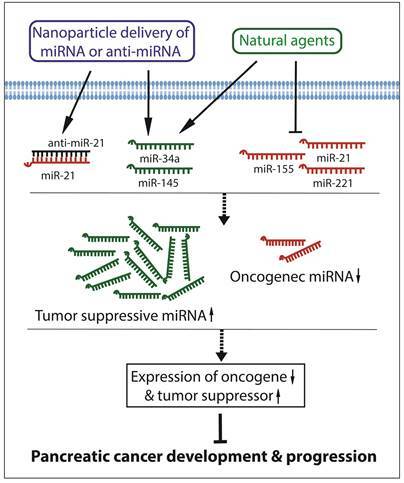 Recently, nanoparticle delivery of synthetic tumor suppressive miRNAs or synthetic oligonucleotides which target oncogenic miRNAs have been investigated for the suppression of pancreatic cancer (Figure 2). It is known that miR-150 is a tumor suppressive miRNA in pancreatic cancer, and thus a nanoparticle-based delivery system for miR-150 (miR-150-NF) was synthesized and tested for its therapeutic efficacy . The miR-150-NF showed high encapsulation efficiency and demonstrated constant release profile, and it also showed efficient intracellular delivery. Moreover, miR-150-NF treatment inhibited cell proliferation, clonogenicity, and invasion of pancreatic cancer through the reduction of MUC4, one of the targets of miR-150, suggesting that nanoformulation could be a safe and effective nanovector delivery system for miRNA delivery in the treatment of pancreatic cancer . The miR-34a is another tumor suppressive miRNAs in pancreatic cancer cells as discussed previously. The miR-34a with tumor-targeting and penetrating bi-functional peptide have been synthesized and it has been reported to be useful for treatment of pancreatic cancer . The miR-34a nanocomplexes significantly suppressed the growth of pancreatic tumor and increased apoptotic cell death via the down-regulation of E2F3, Bcl-2, c-myc and cyclin D1, suggesting the potential use of miR-34a nanocomplexes in pancreatic cancer therapy . In addition, combined delivery of miR-34a and miR-143/145 nanovectors has been shown to suppress the proliferation of pancreatic cancer cells and induce apoptosis via the down-regulation of SIRT1, CD44, aldehyde dehydrogenase, K-ras, and RREB1 . Targeting miRNAs for the inhibition of development and progression of pancreatic cancer. Since miR-21 and miR-221 are both significantly up-regulated in pancreatic cancer, miRNA-21 and miRNA-221 antisense oligonucleotides (ASOs) were co-administrated to treat pancreatic cancer. The results showed that the administration of the combination of anti-miR-21 ASO and anti-miR-221 ASO significantly reduced the primary tumor growth and metastasis compared to single ASO treatment . The expression of miR-17-5p is also up-regulated in pancreatic cancer. It has been found that the administration of miR-17-5p inhibitor suppressed cancer cell proliferation, increased apoptosis, induced caspase-3 activation, and enhanced chemosensitivity to gemcitabine through the up-regulation of Bim expression, suggesting that targeting miR-17-5p could also be a novel approach to decrease the chemoresistance in the treatment of pancreatic cancer . Recently, co-delivery of formulated miRNA and anti-cancer drug to treat pancreatic cancer has been investigated. Since both let-7b and hedgehog (Hh) inhibitor GDC-0449 could inhibit the growth of pancreatic cancer, the let-7b and GDC-0449 were co-formulated into micelles . Both GDC-0449 and let-7b were stable and released into cells with high uptake efficiency and low systemic cytotoxicity. Importantly, this co-formulation of let-7b and GDC-0449 effectively inhibited the growth of pancreatic tumor in mice with decreased tumor cell proliferation and increased apoptosis . In addition, it is known that the anti-cancer activity of gemcitabine in the treatment of pancreatic cancer could be reduced due to the development of gemcitabine-resistance because of the dysregulation in the expression of miR-205 and others as discussed above. To overcome the resistance, gemcitabine conjugated cationic copolymers for co-delivery of miR-205 was designed and synthesized. It was shown that the combination formulation effectively reversed gemcitabine-resistance and inhibited invasion of gemcitabine resistant MiaPaCa-2-R and Capan-1-R pancreatic cancer cells . Animal studies also showed that the combination formulation significantly inhibited tumor growth with increased apoptosis . All the results described above suggest that miRNA delivery or miRNA and anti-cancer drug co-delivery could be novel, efficient and safe approaches for the treatment of pancreatic cancer although further in-depth studies are warranted. Several natural agents including isoflavone, curcumin, 3,3'-diindolylmethane (DIM), and others have been investigated for their effects on the regulation of miRNAs as summarized in Figure 2. Isoflavones are rich in soybean and reported to have anti-cancer activity [70;88-91]. Studies showed that in pancreatic cancer cells isoflavone could alter the expression of miRNAs and normalize the levels of several miRNAs. The regulation of miRNA by isoflavone could be mediated by DNA demethylation and histone modification [92;93]. Isoflavone genistein decreased the level of miR-27a and suppressed cancer cell proliferation and invasion in pancreatic cancer . Isoflavone also increased the expression of miR-146a, and thereby inhibited invasion of pancreatic cancer via the down-regulation of EGFR, NF-κB, IRAK-1, and MTA-2 . Moreover, isoflavone could also increase the level of miR-200 in gemcitabine-resistant pancreatic cancer cells, resulting in the inhibition of the expression of EMT markers including ZEB1 and vimentin, and causing sensitization of pancreatic cancer cells to gemcitabine . Furthermore, isoflavone genistein treatment up-regulated the expression of miR-34a and, subsequently, decreased the expression of Notch-1, resulting in the suppression of tumor growth and induction of apoptotic death of pancreatic cancer cells . In addition, the treatment of pancreatic cancer cells with isoflavone could inhibit the expression of miR-221 and increase the expression of PTEN, p27kip1, p57kip2, and PUMA, resulting in the suppression of cell proliferation and migration of pancreatic cancer cells . These studies clearly suggest the favorable effects of isoflavone in deregulation of miRNAs in pancreatic cancer; however, further pre-clinical and proof-of-concept clinical studies are warranted. Curcumin is mainly obtained from turmeric [96;97] and possesses antioxidant, anti-inflammatory, and anti-cancer activity [97-99]. Curcumin up-regulated the expression of miR-22 and down-regulated the expression of SP1 transcription factor and estrogen receptor , two of the targets of miR-22, resulting in the suppression of growth of pancreatic cancer. Because of the low bioavailability of curcumin in vivo, curcumin analog CDF was designed and synthesized. It has been found that CDF with greater bioavailability than curcumin induced the expression level of miR-101 and decreased the level of EZH2, one of the targets of miR-101. CDF also induced the expression of let-7 family, miR-146a, and miR-200 family, resulting in inhibition of cell growth, sphere formation, and invasion of pancreatic cancer cells . Moreover, CDF inhibited growth and migration of pancreatic cancer via the suppression of miR-221 and subsequent up-regulation of PTEN, p27kip1, p57kip2, and PUMA . In addition, treatment of pancreatic cancer cells with CDF caused re-expression of miR-146a and down-regulation of EGFR, ERK1, ERK2, and K-Ras expression, suggesting the important role of CDF in miR-146a regulated expression of EGFR, ras, ERK and associated signaling . 3,3'-diindolylmethane (DIM) is the in vivo self-dimerized product of indole-3-carbinol which is derived from cruciferous vegetables [103;104]. DIM has shown its anti-cancer activities [70;90;105-107]. In gemcitabine-resistant pancreatic cancer, DIM increased the levels of miR-200 family, let-7 family, and miR-146a, resulting in the reversal of EMT, inhibition of invasion, and induction of sensitivity to gemcitabine through the inhibition of EGFR, MTA-2, IRAK-1, ZEB1, and NF-κB signaling [70;90]. Moreover, DIM also inhibited pancreatic cancer cell growth and migration via the down-regulation of miR-221 and subsequent induction of PTEN, p27kip1, p57kip2, and PUMA . These findings demonstrate the role of DIM in the regulation of miRNAs, suggesting that DIM could be useful in the therapy of pancreatic cancer, and thus further in-depth studies are warranted. In addition, many other natural agents such as rosemary and resveratrol also exerted their effects on the regulation of miRNAs. Resveratrol is mainly present in grapes. It was found that resveratrol inhibited pancreatic cancer cell growth via the down-regulation of miR-21 and Bcl-2 expression . Rosemary (Rosmarinus officinalis L.) extracts could up-regulate the metabolic-related gene GCNT3 and down-regulate its potential epigenetic modulator miR-15b, which could be the mechanism underlying the anti-cancer activity of rosemary . Brucein D is a naturally occurring compound extracted from Brucea javanica fruit. Brucein D has shown its anti-cancer activity against pancreatic cancer. It was also found that Brucein D regulated the expression of miR-95 and CUG triplet repeat RNA-binding protein 2 which is one of the targets of miR-95 . All these findings demonstrate the abilities of natural agents in the regulation of miRNAs, suggesting that regulation of miRNAs by natural agents together with conventional anti-cancer therapeutics could become a new approach for overcoming drug resistance in order to achieve better treatment outcome of pancreatic cancer patients. In conclusion, growing body of evidences has shown that the aberrant expressions of miRNAs significantly contribute to the development and progression of pancreatic cancer. The aberrant expression of miRNAs with the aberration in cellular signal transduction is the molecular basis of pancreatic carcinogenesis and cancer progression. The altered miRNA expression profiles of serum and cancer tissues from patients with pancreatic cancer are significantly correlated with the diagnosis, grades, and prognosis of pancreatic cancer. Thus, targeting the altered miRNAs by novel approaches could become promising strategies for prevention of tumor progression and also for the treatment of pancreatic cancer. Recently, treatment with natural agents for the modulation of miRNAs or nanoparticle deliveries of synthetic tumor suppressive miRNAs or synthetic oligonucleotides which target oncogenic miRNAs have been conducted as a proof-of-concept for pancreatic cancer treatment. The pre-clinical in vitro and in vivo studies have demonstrated that the nanoparticle delivery of synthetic oligonucleotides or treatment with natural agents such as isoflavone, curcumin, DIM, and others may be useful to up-regulate tumor suppressive miRNAs and down-regulate oncogenic miRNAs, which would likely cause suppression of development and progression of pancreatic cancer. In summary, therefore, targeting miRNAs with novel approaches combined with conventional anti-cancer therapeutics could become promising strategies for overcoming drug resistance and achieving better treatment outcome in pancreatic cancer patients. However, further in-depth pre-clinical and clinical studies are warranted for realizing the benefit of miRNA targeted therapeutics in pancreatic cancer. The authors' work cited in this review article was funded by grants from the National Cancer Institute, NIH (R01CA108535, R01CA154321, and R01CA164318 awarded to FHS). We also thank Puschelberg foundation for their generous contribution.